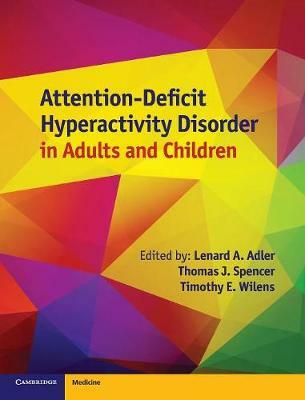 Author(s) Adler, Lenard A.; Spencer, Thomas J.; Wilens, Timothy E.
Attention-Deficit Hyperactivity Disorder (ADHD) is a chronic neurobehavioral disorder characterized by persistent and often acute distractibility, hyperactivity, and impulsivity. It is a condition usually associated with children but in recent years the diagnosis of ADHD in adults has risen significantly. ADHD often coexists with a wide array of other psychiatric illnesses, including depression and bipolar disorder, thus complicating its assessment and management. In Attention-Deficit Hyperactivity Disorder in Adults and Children, a team of world renowned experts bring together the recent research in this area and cover the history, diagnosis, epidemiology, comorbidity, neuroimaging, and a full spectrum of clinical options for the management of ADHD. The wide ranging, detailed coverage in this text will be of interest to psychiatrists, psychologists, social workers, coaches, physicians, or anyone who wants to develop a deeper understanding of the etiology, characteristics, developmental process, diagnostics, and range of treatment modalities.